iFix has voided yet another warranty in order to show us exactly what makes the new Droid Razr tick. To open the phone, they begin to saw the unit apart with a dozuki, but quickly realized a spudger and plastic opening tool were also reasonably effective. Motorola has been making a come back after being set aside for years by other companies that have had a seemingly endless stream of hipper smart phones. About two years ago though, the company introduced the Droid, which turned out to be a very successful smartphone series. Back in action, the company is betting its super-identifiable Razr namesake and styling will bring back the same "wow" factor as it did in 2004. Be sure to check out our hands on review, if you have not already. The Droid Razr packs a lot of technology into a "razr" thin form factor, so what we find inside the phone is an impressive amount of thoughtful engineering. The unit is packed tight with no room to spare, filled with EMI shielded chips, an ultra-thin 1750mAh battery, tiny ribbon cables and a lot of adhesive. The website rates the Droid Razr a 4 out of 10 on its repairability score, a rating low enough to probably scare away all but the most confident do-it-yourselfers. iFixit also notes some unusual design elements. The digitizer (the glass on the front) is permenantly adhered to the AMOLED LCD display, which makes breaking the digitizer an expensive accident. Also, there are a tremendous amount of chips on the system board facing the display which makes it eerily devoid of all visible circuitry on the bottom. 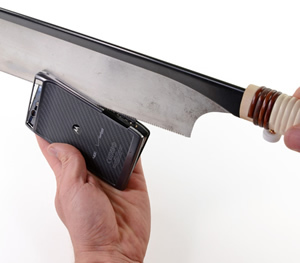 This was done to keep the Razr slim, no doubt. Images courtesy of iFixit. You can view the full teardown here.